I grew up in Iowa, a place of simplistic beauty. My daughter and her family still live in eastern Iowa so I often travel back to the place where I spent almost 20 years. Last spring we took a short field trip (literally… it was a trip through the farms and fields) to Kalona, Iowa – a twenty-minute drive from my daughter’s house. I used to visit this beautiful area almost 40 years ago when I worked as a nurse in Iowa City. These were the days before the farmer’s market movement so I was always on the hunt for fresh cheese, produce and eggs. This charming rural town is home to a large number of Amish families and contains many locally owned shops, bakeries and restaurants. A subgroup of the Christian Mennonites, Amish churches provide rules that include simplicity in the way their followers live and dress and instruct their congregants survive without the ease of modern technology. My grandson Zay was fascinated with the horse drawn buggies, the mode of transportation for observant Amish families even during sub-zero Iowa winters and sweltering, humid summers. Amish women wear dark colored, long garments, sensible shoes and white or black head coverings and the men have long beards and they wear brimmed hats. The most devout in this community do not use electricity, and they certainly do not own cell phones or computers!! They utilize oil lamps in their businesses; all machinery for farming and manufacturing is run by manpower. Many Amish men and women allowed me to photograph their businesses and horse drawn carriages but humbly stated that they did not want their pictures taken! During this trip to Kalona, we began at the cheese factory and watched the cheese curds (AKA squeaky cheese) being stirred. The curds were fairly bland, buttery yet salty and definitely squeaky. We bought a small bag of them and ate most of our stash in a short time. They were perfect “kid” food – easy to grab and nutritious to boot. Next was the Stringtown Grocery where we bought bulk mini cinnamon chips (which I use for my scones), local pastry flour and small vegetable starts for leeks and onions. 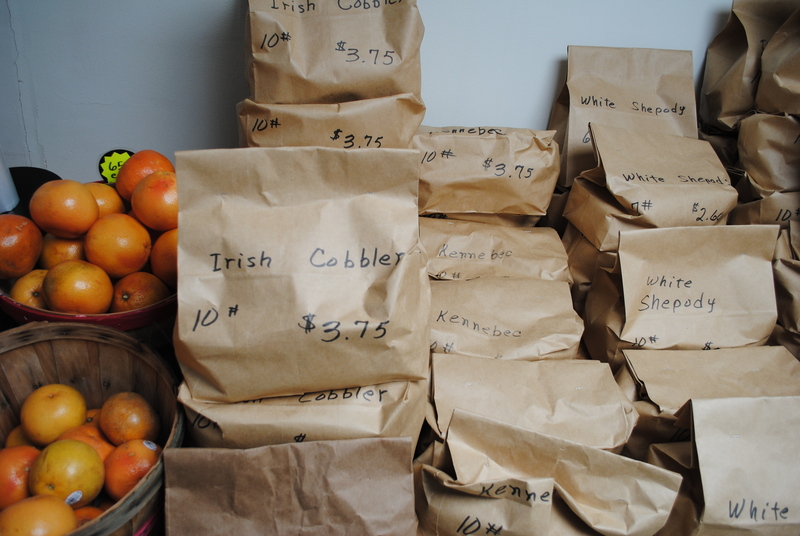 There were more than 30 varieties of potatoes packaged by hand in paper sacks, many with names that were new to me. Our final stop of the morning was the Golden Delight Bakery! In addition to beautiful homemade berry and cream pies, breads and pastry, the establishment sold freshly made glazed doughnuts. The women allowed me to photograph the work space where they were getting ready to bake pecan logs, apple pies and rolls. Without electricity the room was exceedingly quiet and peaceful and the women chatted amicably with each other. They courteously answered my many questions and eyed us with amusement. On the way out we purchased doughnuts, ate them outside on a picnic table then returned home a much-needed nap. 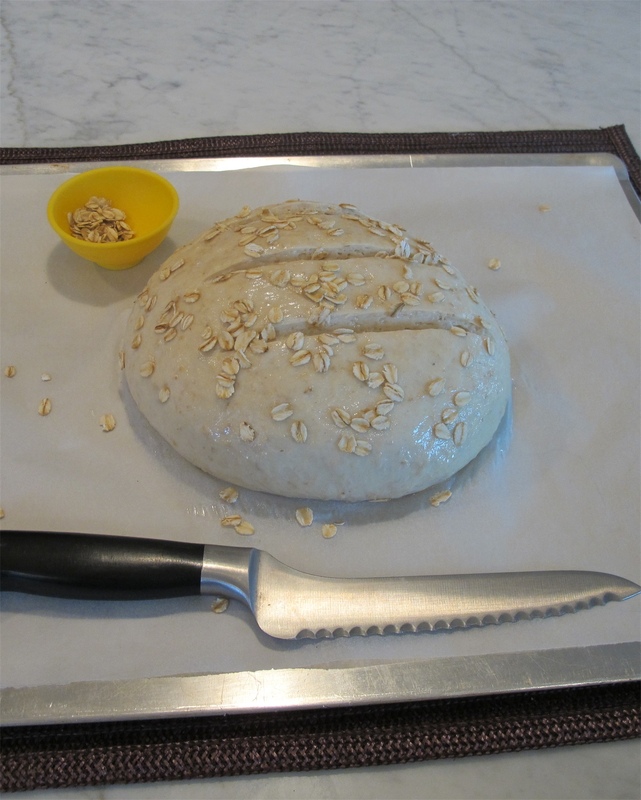 Once I had a chance to rest I decided to use the freshly-purchased flour to bake some of my family’s favorite Honey Oatmeal Bread (recipe below) and soon the kitchen smelled almost as good as the Bakery in Kalona. What a morning! And such a great reminder that foodies like me don’t need to travel to exotic locations when in so many instances a short drive down a country road will reveal an entirely different world – sometimes a world that has stood still for over 100 years. This is a sweet tasting, very moist bread that is loved in our family. 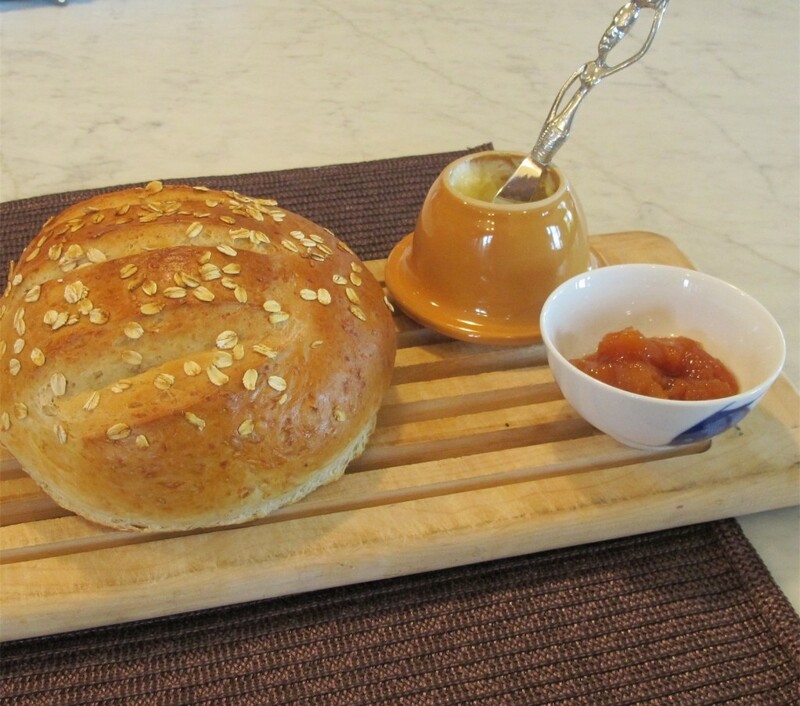 It’s perfect for toasting and I love to serve it with fresh butter and a bit of honey. And it freezes very well for up to a month. Pour boiling water over oats and stir to blend. Mix in shortening and honey. Cool until lukewarm, (less than 120 degrees) then blend in yeast and let stand 5 minutes. You should see a little bit of foaming action from the yeast/honey mix. Add salt and 4 cups of flour and beat together with a rubber spatula. Let the dough rest 10 minutes, add flour bit by bit until it forms together and is a bit sticky but can be kneaded on the counter. Clean out the mixing bowl and oil or butter the inside of your clean bowl. Place the smooth ball of dough inside and cover the bowl with a tea towel and let it rise in a warm place for 1 hour. Punch down the dough, form two smooth balls and let it rest again for 5 minutes. Knead a couple of minutes to get the air bubbles out and pat each ball into a rectangular shape, about 10 inches wide by 12 inches long, and roll like a jelly roll, shaping into two loaves. Gently place each loaf into a well greased 8 ½’ x 4 ½’ x 3’ pan and let the dough rise 1 hour in a warm place covered with an oiled piece of saran wrap. After the dough has been rising for 1/2 hour or so, preheat the oven to 350 degrees. When the oven comes to temperature and the total rising time is between 50-60 minutes, brush the top of each loaf with beaten egg white mixed with a about 1 tsp of water. Sprinkle tops with some oat flakes, and rebrush with the egg white mix to keep the oatmeal flakes from falling off. Bake ½ hour at 350 or until internal temperature registers 190 degrees. Let cool for 5 minutes, then gently shake the bread and remove to a rack, leaving the loaf on it’s side. Wait at least 20 minutes before slicing into the loaf and do not put in plastic wrap or freeze for at least 4 hours so the internal temperature is cool. NOTE: You can use 1 cup of whole wheat flour in place of 1 cup bread flour, and can make ½ recipe in you don’t want two loaves. In these pictures I made a free form round loaf without a bread pan which works as well. This entry was posted in Breads, North America and tagged Honey Oat Bread, Iowa, Kalona. Bookmark the permalink. I know this is supposed to be about food and travel and all, but that kid is SO darn cute I can’t stand it! 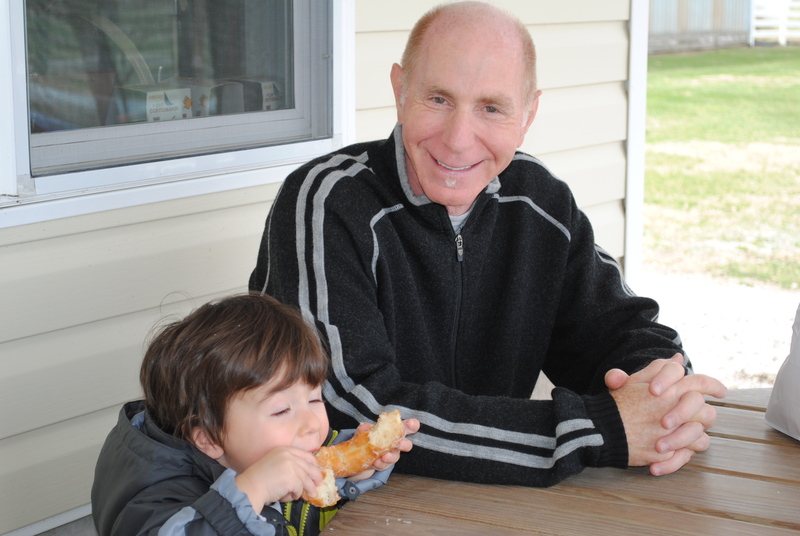 he’s younger there–what a great eater. He loves sushi, all kinds of weird veggies, kale chips..gotta love it.